One of the most important points of the adoptions problem by the UCKG’s summit in Lisbon is to establish whether or not the church of Bishop Edir Macedo has a policy of mass sterilization. It is a fact that pastors were instructed not to have children. The question is whether or not they were obliged to undergo vasectomy. Two central reasons are pointed out by ex-missionaries of the UCKG as a justification for the ban. The first, selfish in nature, realizes that Edir Macedo’s daughters could not get pregnant. The wicked ego of the patriarch would have decided that, due to the impossibility of his heirs, no one in his church could conceive. The other reason would be practical. Children would jeopardise the expansion of the UCKG because they cost the institution more and often prevent the relocations of pastors between one temple and another. It is probable that both forces have acted in the events related to the Camarate Home. In the series The Secret of the Gods, produced by TVI of Portugal, there are several testimonies of ex-ministers who claim to have been forced to undergo vasectomy. This would be a Universal imposition for all pastors and young bishops. Before getting married, everyone would be required to have surgery – albeit very young and without children. Anyone who refused would not make a career, would be sent to the worst places and get fired. There are many other testimonies that converge on the hundreds of employment lawsuits in which the institution is accused of demanding vasectomy. In Brazil, there is a specific law to regulate human sterilization. Article 10 of Law 9263/96 stipulates that surgery can only be performed “on men and women over twenty-five years of age or with at least two alive children.” All sterilizations must be compulsorily reported to the Ministry of Health. The penalty provided for anyone who opposes this rule amounts to eight years imprisonment, but may be increased by a third depending on certain aggravating factors. Article 12 of the ‘Vasectomy Law’ criminalizes the obligation imposed by the UCKG. It states that “individual or collective encouragement or influence to the practice of surgical sterilization is prohibited”. And Article 13 vetoes “the requirement of a certificate of sterilization or pregnancy test for any purpose”, a practice by which the neopentecostal sect has already been condemned with finality in a lawsuit initiated in Itapevi, in Greater São Paulo. The UCKG was questioned on the subject, but did not answer the questions sent to it by the Pannunzio Blog. On its website, the religious company denies the practice of mass sterilization. But there are several reports, documents, judicial sentences and court judgments that indicate otherwise. In fact, from the late 1980s, objection to children became an express order, which was rebroadcasted to the clergy by the bishops. “By order of Bishop Macedo, from today the pastor, he will only bear children in the spirit. From this date it is no longer for the pastor to have children, do you understand? ” The order was passed on by Bishop Luis André during a council with his subordinate Angolan pastors. Despite of the over 30 years of the practice that the UCKG adopted, the subject was always far from the Brazilian press. Only one mention of the problem was made in August 2016, when the journalist Monica Bergamo of Folha de São Paulo reported that the Universal Church of the Kingdom of God had been investigated for the supposed practice of mass sterilization. Nothing more was said in any vehicle of communication. The silence over sterilization in its entirety resembles the silence that was heard when TVI broadcasted The Secret of the Gods. The Brazilian press is definitely not interested (or brave enough) to publish the accusations against the UCKG. The investigation mentioned by the newspaper of São Paulo resulted in the first conviction with a final judgment against the UCKG. The religious company was condemned to pay an compensation of R$ 100 thousand Reals to the ex-pastor Nilton Vieira Borges. He worked for the UCKG for six years on two occasions. In 2004, he was offered the chance to become a bishop and be sent on mission to the African continent. But for this to happen, he would have to have a vasectomy. The young pastor was newly married to a 21-year-old servant of the church who wanted to have children. Despite his wife’s opposition, Nilton Vieira underwent surgery, which was funded by the Universal Church. In spite of this, the promotion to the bishop did not happen, as promised. To make matters worse, the sterilization frustrated his wife to such an extent that the marriage went into crisis and soon came the divorce. Former pastor Nilton Vieira was represented by lawyer Márcia Cajaíba. Due to her acting in similar cases, Cajaíba eventually became a specialist in prosecuting the UCKG. Today, in her office alone, there are 84 employment claims from former UCKG presbyters. They all tell stories similar to those of Nilton and his ex-wife. They are very young pastors with low level of formal education who were hired by the church without any rights. And everyone reports that they were also forced into sterilization despite their young age and lack of children. The decision that condemns the UCKG: “Highly harmful conduct to the worker”. The TRT of São Paulo established that the vasectomy was the cause of “damages in the family sphere of the worker and caused him the loss of the chance of having children”. And ordered the church to compensate the former pastor for $ 100,000 for moral damages. In her vote, the judge even took a decision that is likely to cost Edir Macedo’s church a high price: she sent a letter to the Public Employment Ministry, which was already involved in another case – a public civil action that was being processed by the Employment Court from Rio de Janeiro. Less than two years ago, Attorney Valdenice Amália Furtado of the Rio de Janeiro Public Prosecutor’s Office noticed that there were an unusually high number of employment lawsuits filed by former UCKG’s pastors with very similar claims. They reported having been forced to undergo vasectomy as a condition to stay in the church or receive promotions. The UCKG also refused to properly register them as employees, despite clear ties of subordination, inhuman working hours and the obligation to collect money, which played a central role in the scope of pastoral activities. Evangelization and activities of a strictly religious nature always came second. The federal prosecutor made a survey of the occurrence of similar cases throughout the country. She found out that the UCKG is persistent in these types of practice. Hundreds of lawsuits were found in all courts. One of the cases in this enormous collection of cases concerns a pastor from Volta Redonda, RJ, who failed to meet the collection goal established by the UCKG and received an extreme punishment. Bishop Darlan, responsible at the time for the temples of the state of Rio de Janeiro told the pastor that “he would be punished, subjected to performing general maintenance services, cleaning the temple, and without pay”, a situation that lasted from November 2010 to February of the following year. To restrain the deleterious practices of the UCKG, the Employment Ministry requested that the church of Bishop Edir Macedo should be condemned as an example. The main punishment is the payment of a fine of R $ 100 million, the equivalent of 25 million euros, to be paid to the Workers’ Assistance Fund. In addition, the UCKG will have to officially register of all its pastors and bishops according to the employment laws, pay statutory rights and collect taxes and contributions provided for in the CLT (Employment Laws Consolidation). They must also refrain from demanding vasectomy or examination to prove it, and post a statement of that prohibition in all your temples. The public civil action has not yet been tried. The proceeding suffered a setback at first instance, which was soon corrected in the second when the MPT (Public Ministry of Employment) appealed against the judgment of the 43rd. 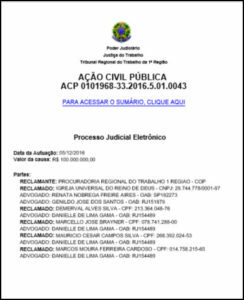 Employment Court of Rio de Janeiro, which did not recognize the legitimacy of the Public Prosecution Service to file a public civil action. The ruling, however, has been overhauled by the First Regional Employment Court, and is now awaiting trial. For the performamce of vasectomies, the pastors report that the UCKG used a network of clinics that performed surgeries without notifying the Ministry of Health. And not only in Brazil. The scheme was repeated in countries where the UCK was set up and grew rapidly. Among them, the number of objective citations stands out: Clínica Santo Espírito, in Vitória, ES; Clinic of Dr. José Osmar Cardoso, in São Bernardo do Campos, SP; Cruz Azul Hospital, in Managua, Nicaragua; and Dupuytren Sanatorium in Buenos Aires, Argentina. But the network of the sterilization network can be even bigger. There is information on clinics in the interior of Paraná and Santa Catarina. The Pannunzio Blog tried to contact the doctor and the clinics that are in Brazil, but did not obtain a response. In Portugal, where some of Bishop Edir Macedo’s current greatest adversaries reside, there would also be at least one clinic to meet the demand of the UCKG. Former pastor Lucas Paulo, the adopted son of former bishop Alfredo Paulo, told TVI how the scheme worked. According to him, “pastors would queue up in clinics to do vasectomy. It looked like a slaughterhouse. The pastors would came in, get out, another would come in and so on. Then one would wait for the other outside with ice and go to church”, he revealed in the series The Secret of the Gods. In Angola, the accusations have been lodged in the Youtube channel of UCKG’s former pastor Tavares Armando, who uses the Internet to make public the bad practices of the sect he served for five years. According to him, bishop João Leite, who is responsible for the business of the UCKG in his country, obliged the local clergy to do the sterilization in order to get a house in a condominium or the “consecration”, a term that the sect uses to designate the promotion of its presbyters to regional pastor. In the face of the severity of the reports, the repetition of denunciations, the contumacy of actions, it is very difficult to accept that a denial of two paragraphs on the UCKG’s website is sufficient to clarify the matter. This is because it is no longer just a matter of accepting an unspecific justification, but of taking into account what various judicial bodies have already established as factual truth. The UCKG argues with imprecise statistical data. It says the biggest proof that it does not force anyone to do vasectomy is the fact that many pastors have children. But the argument loses consistency because the institution refuses to say how many have undergone sterilization and how many have not. This statement was recovered by reporters Alexandra Borges and Judite França. The audio can be heard at the end of this post. In fact, the UCKG is not, as its ultimate leader and founder says, a social institution. It increasingly resembles a gigantic for-profit corporation that grows like an amoral octopus, unmindful of the suffering it causes in the pursuit of ever greater tithes, offerings, and donations. The company of prayers made by sterilized young people is not accustomed to account for their actions. The strategy it adopts is intimidation. Whenever someone discovers their plots, what they do is threaten with a series of prosecutions. In the case of this report, It has deliberately failed to answer an extensive series of questions after accusing the author of having failed with the ethical duty for not listening to the other side, which is an absolute untruth. In this video, a collage of Edir Macedo’s own speech about the right to have children.